The other night I bought groceries to make dinner for my boyfriend but once I got home I just didn’t have it in me to make what was on the menu. It was going to have to wait until another night. When I shop for groceries I am usually buying for a specific purpose or recipe so I don’t end up having much of substance just hanging around my place. I say this, but yet my pantry and refrigerator always seems full of something, but it usually does not equal a meal. Odd. The goal on this particular night was to make a decent dinner with what I had on hand. It came out pretty well. We dined on grilled cheese with caramelized onions, apple butter and turkey and skillet potatoes. I remember my mom making skillet potatoes often when I was growing up. They are so yummy and versatile. The potatoes are the base and you can add any seasonings or veggies you have on hand. I am not providing an exact recipe, because I don’t have one. It is really more of an idea or method. This time I used baby potatoes, poked them with a fork and started them in the microwave for a couple of minutes to speed up the process. Once they had started to soften I cut them in thick slices. I sautéed a few chopped shallots and garlic in olive oil. 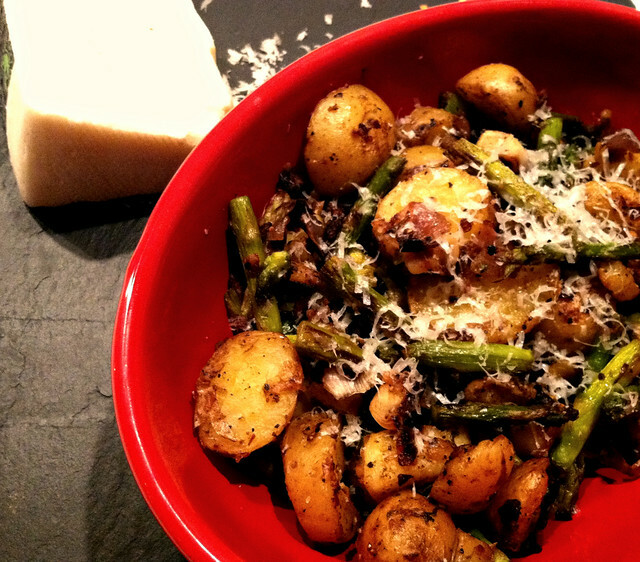 I added the sliced potatoes and asparagus. I cooked everything until the potatoes were browned and crispy and the asparagus was cooked but still a little crunchy. I seasoned the pan with salt, pepper, red pepper flakes and garlic salt. Right before we ate I grated romano cheese on top. The Perfect Pairing for skillet potatoes is basically whatever you have left hanging out in the refrigerator or pantry. You can substitute baking potatoes for baby potatoes, onions for shallots, green beans or broccoli for asparagus, add a can of drained ro-tel tomatoes, top with any cheese you have on hand. Throw in some fresh herbs like rosemary, chives, thyme or basil. You can’t screw them up!